Yesterday Google introduced a ‘remote signout’ feature for Gmail, providing a capability that sets an inportant precendent for web-based applications and indeed web workers. Most web workers tend to hop between multiple devices to access our web applications; Gmail is a great case in point with multiple interfaces mechanisms spread across web, mobile, IMAP and POP3 formats, however it’s easy to lose track of where you’re signed in and compromise a little of your privacy and security if you’re not careful. 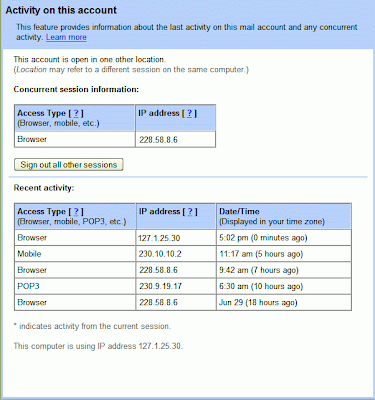 Remote Signout enables Gmail users to keep track of recent sessions by IP address and remotely logoff from any of those sessions if the time or location seems suspect. Gmail inboxes, where the feature is being rolled out progressively, will include a new item in the footer labeled ‘This account is open in x other locations’ with a link to a more detailed view, as illustrated here to the left. Of course, you’ll need to know your own IP addresses to understand if any unauthorized usage is taking place, so it’s not the best user experience, though it works and is a welcome feature. More significantly Remote Signout sets an important precedent for all web applications – namely that such a feature should be a design pattern employed in all web applications. Oftentimes the only indication a user has of malicious use is when unusual things begin to happen within their services, in real life, or the arrival of unsolicited password reminder email in their inboxes! By wiring in the means to audit access usage of an application, one of the barriers to policing your personal security and privacy is lowered, enabling us all to be just a little more preemptively vigilant.